Framework sounds like a futuristic, Frakenstein-like treehouse. 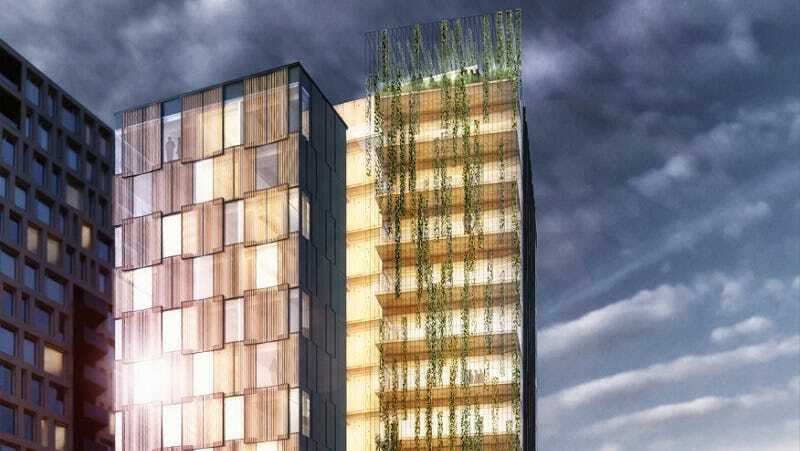 But as one of two winners of a contest for high-rise buildings built out of wood, it’s a actually a glimpse into the future of urban architecture. The 12-story design will be one of the tallest wooden buildings in the United States once it’s completed—and many hope it will start a drive for more such buildings. Oregon-based architecture firm Lever Architecture designed Framework to be built in its hometown of Portland. In late September, the plan was named West Coast Winner of the USDA’s Tall Wood Buildings Prize competition, given out in September with support from the Softwood Lumber Board. The East Coast Winner, a 10-story design for 475 West 18th Street, will be built in New York. With its dozen floors, Framework is the taller of the two, designed to be smaller skyscraper with shops on the ground floor and offices and apartments up top. It could also be the tallest wooden skyscraper in the country when completed. Each firm will receive $1.5 million in funding to bring their designs to fruition. The money is not purely for funding. It’s also for research that will allow architects to build taller, stronger wooden buildings in the future. Some sources refer to this as the “first” Tall Wood Buildings Prize, which implies there will be a second. That’s not unrealistic. Wood is becoming less of an antiquated building material. The first true sky scrapers came when steel eliminated the need for incredibly thick walls to support taller structures. Wooden buildings were increasingly viewed as a fire hazard and an easily breakable support. The new structures use cross-laminated wood panels as building supports. These panels are created by pressing planks of wood together with the grain alternating directions, until they make one, huge beam. These beams are already supporting taller and taller buildings. Safety restrictions, originally designed to prevent structures made with conventional wood from collapsing, are still in place, however. Those need to be changed before truly massive wood skyscrapers become the norm. Framework will still be using some concrete as the foundation for the building in its design. It will be bisected by a central core to help support its mass. The rest of the support will be done by the framework of beams that give the building its name. One particularly ambitious decorative touch will be a wall of hanging plants going down one side of the structure. If we want to make wilder cities, that would be a good way to start.